The most important takeaway from Xiaomi's Mi-4 launch was the amount of media attention it received. In response, some have begun to question the validity of Xiaomi's proposed business model. Interestingly, Xiaomi has been fairly transparent revenue from services. We can use this to benchmark Xiaomi's monetization performance with other leading in services players. 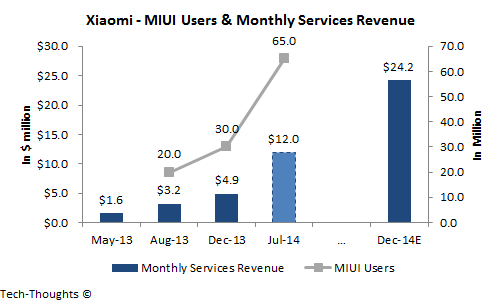 The chart above shows Xiaomi's monthly services revenue and the size of the MIUI user base. The data shows that Xiaomi's monthly services ARPU was flat from August to December 2013 even though their product mix has seen a shift towards lower priced devices. At the Mi-4 launch, Xiaomi announced that their user base had grown to 65 million, which implies monthly services revenue of roughly $11-$12 million. Of course, we still have no frame of reference to understand what these numbers mean. 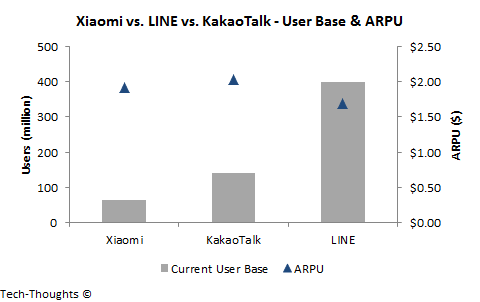 As the chart above shows, Xiaomi's annualized services ARPU is actually comparable to LINE and KakaoTalk (based on 2013 net revenue figures and average user base). Of course, Xiaomi has a smaller user base -- 65 million, as compared to ~400 million and ~150 million for LINE and KakaoTalk respectively. Xiaomi's user base has seen explosive growth, but they need to push their user base well above 100 million to be taken seriously as a services player. This brings us to their hardware business. Xiaomi has been fairly transparent about their strategy of selling premium hardware roughly at cost. In order to increase their high-margin services revenue, they need to increase the size of their user base. And in order to increase the size of their user base, they need to maximize smartphone sales. Is their smartphone sales performance up to the task? At the launch, Xiaomi announced that they had sold 57.36 million smartphones to date. Deducting the 52 million smartphones sold until the first half of 2014, we get 5.36 million smartphone sales in 21 days. The fact that it came at the tail end of their product cycle makes this particularly impressive. This also reinforces my belief that the lack of cyclicality in Xiaomi's sales is a strong indicator for future performance. 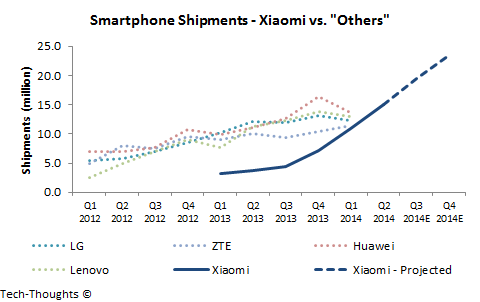 If Xiaomi can simply maintain this pace for the rest of the year, they would end up selling more than 40 million smartphones in H2 2014. This could push their user base over 100 million as soon as December 2014.